Keringke Art Centre is situated in the community of Ltyentye Apurte. The community was named for the stand of bloodwood trees nearby and Keringke Arts is named after an important and ancient place, nearby, that was formed when the ancestor Kangaroo was passing through this land. Several of the Keringke Artists have responsibilities associated with the Keringke Rockhole site. 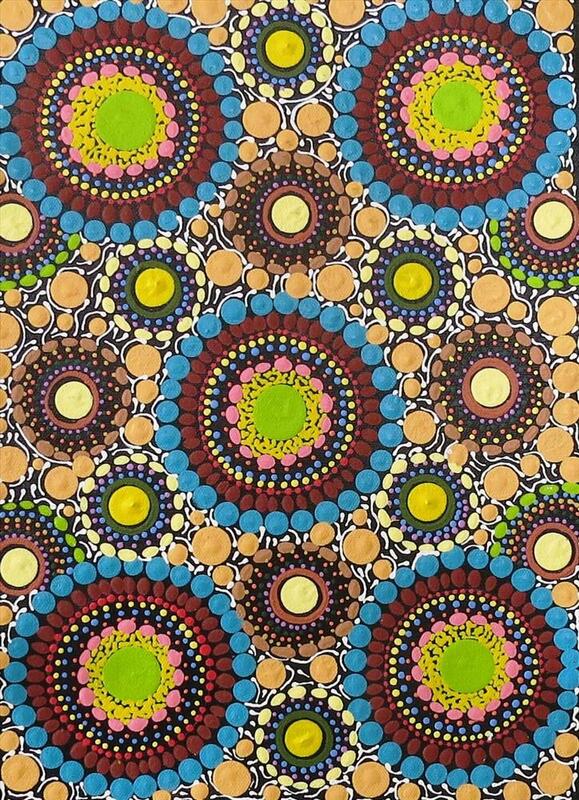 Keringke Arts today produces a wide variety of art products, reflecting the colour, rhythm and ambience of the land that is home for the Eastern Arrernte artists. The artists are represented nationally and internationally in many collections, and the work is prized for its unique style and authentic connection to an ancient living culture. Various painters have developed this style of painting at Keringke Arts over a twenty-year period. The artists use pattern, colour, shape and design to create paintings that depict country, culture and self. These shapes and designs may have features common to ancient rock art and petroglyph designs found throughout the traditional country of Eastern Arrernte. Some designs may reflect sand and body paintings. Most commonly, in this contemporary form, the art is not attributed to any particular thing, but expresses the life world of the particular artist. The Eastern Arrernte cultural identity includes a dreaming, a skin name, a place, as well as family name, language, and community. These things are not necessarily reflected in the design or outcome of each painting.